No two players' experience will be the same in the upcoming Lord of the Rings game, Middle-Earth: Shadow of Mordor. In a recent preview, I explained how that is and how the Nemesis system fits into that. If you missed it, you can use the Nemesis system to target various warchiefs and have their bodyguards turn against them, thereby shifting the power struggle in a way that's more advantageous to you. Commanding the bodyguard to do so successfully will leave that entire army at your disposal. It's how you will eventually take on Sauron with any hope to live to tell the tale. Those warchiefs that you meet in your Nemesis system menu, however, are unique to you. There is a combination of personality, look, and enemy statistics that morph together to form an encounter that no other player should see. ...it's because he remembers the two encounters we had. His name, look, stats and personality converge to create a character that is wholly unique to my game, I am told. I reached out to find out more about how exactly this unique system works. Design director Michael de Plater had an explanation for me. "There are many different components of the Nemesis System that are both specific and connected," he said. "Each dynamically generated enemy remembers the interactions players (and other enemies) have with him and reacts accordingly when they meet again." Hence the taunting in the video above. 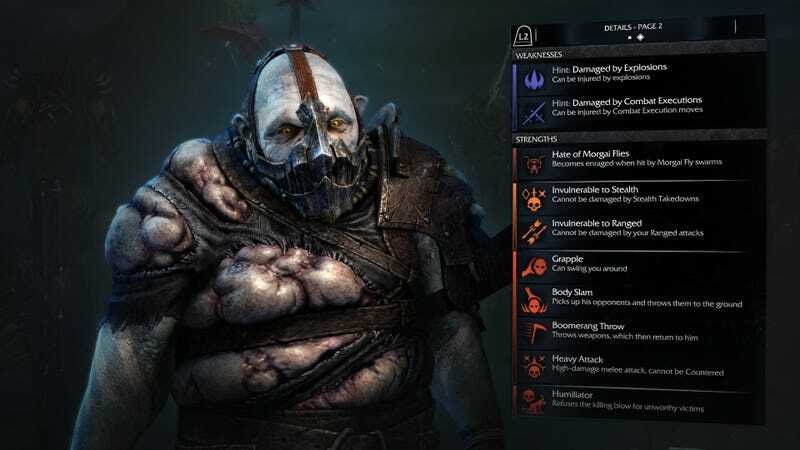 "To name just some examples, uniquely generated elements like visual appearance, personality, skills, abilities and power level, become connected to an Uruk's battles, relationships, dialogue and location within the world; each of these influences the others to ensure that they are generating memorable characters who continually evolve to create unique stories at the same time as proposing varied and challenging gameplay scenarios," he continued. In my encounters with Latbag roughly two weeks ago during a demo in Los Angeles, I tried to get this guy's bodyguards to usurp him twice. I failed twice, clearly, because he is still alive. If I recall correctly, I believe the first bodyguard I pitted against him was either too weak or I didn't protect him well enough, because he died before we could kill his ugly leader. The second time around, Latbag took off on foot, fleeing as fast as he could mid-battle. I was so distracted by trying to kill off the remaining enemies that I almost didn't notice at first. Of course I took off after him, but I never could catch up and eventually gave up. So the next time I play, should publisher Warner Bros. and developer Monolith Productions hold on to my save as they did when they supplied me with this screenshot and video, I might be able to get my revenge then.